Charlie Coyle didn’t think he was fast enough to compete on the national level, but he has handled the speed of the game and the pace of his life with stunning ease. USA Hockey History: Tied in scoring lead on the U.S. National Junior Team that won the bronze medal at the 2011 IIHF World Junior Championship. 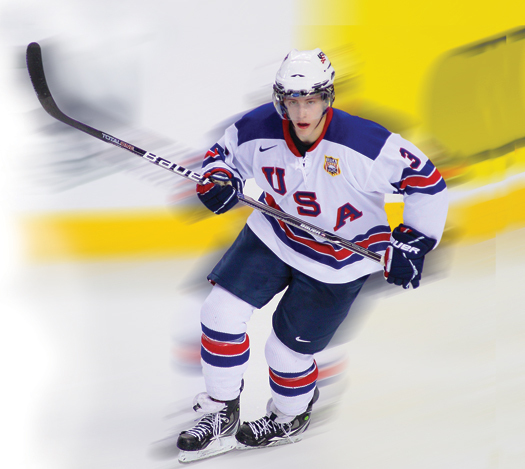 In a six-month span, he graduated high school, earned a spot on Team USA’s entry at the 2011 IIHF World Junior Championship and became a regular forward at Boston University. Things have been happening fast for the East Weymouth, Mass., native ever since he left Thayer Academy to finish high school at home, all the while playing for the South Shore Kings of the Eastern Junior Hockey League. If not with the Kings, he’d work out with players from the local high school team. That attitude is a big reason BU head coach Jack Parker welcomed him into the program at age 18. “We weren’t sure what year we were going to take him, but he played so well it was obvious,” Parker said. “He’s a kind of a throwback to an older generation. He’s not one of those clinic kids who skates fast and shoots fast, but when you put him in a game it’s not so much. Coyle’s ability to improvise, protect the puck and make plays out of contact situations has drawn comparisons to legendary power forwards like Cam Neely. The first EJHL player ever to be selected in the first round of the NHL Entry Draft (San Jose 28th overall in 2010), Coyle comes from a hockey-rich family. Chuck played Junior hockey and coached his son, and former NHLers Tony Amonte and Bobby Sheehan are Chuck’s cousins. Coyle’s 2 goal, 4 assist effort in six World Junior Championships games matched Chris Kreider and Kyle Palmieri for the Team USA scoring lead, and WJC coaches selected Coyle as the Americans’ top forward in the tournament. When everything changed, Chuck called it a dream come true because he knew it was Charlie’s dream. Boston College star Scott Harlow, his Junior coach, and Kings weight trainer Brian McDonough. The year in Juniors prepared the Coyles for Parker’s sales pitch. 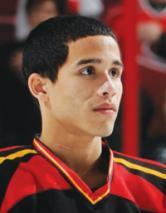 At 6-foot-2 and 208 pounds, Coyle continues to grow on the scales as well as in life and in hockey. Through 33 college games, his 23-point totals tied him for third in the Terriers scoring race. “He’s not projecting where he’s going to be two or three years from now,” Parker said. A passion for hockey has carried Robert Pelley through good times and bad. It’s what allows him to overcome obstacles most people couldn’t. The 17-year-old was diagnosed in 2009 with an aggressive germ cell tumor that engulfed his left lung. Despite chemotherapy, the tumor remained and led to the removal of his lung in December of the same year. While most cancer patients have difficulty moving on back to the normal life they had once lived, Pelley persevered. And while his shift time has lessened, he is back to doing what he loves the most.